Various planets in the Milky Way, including Sanghelios. "So full of hate were our eyes that none of us could see. Our war would yield countless dead, but never victory." The War of Beginnings, also known as the San'Shyuum-Sangheili War and the First Age of Conflict, was an interstellar war set between the Sangheili species and the Reformist San'Shyuum, over religious and technological differences. At the conclusion of the war, the Writ of Union was penned and initiated, and the Covenant was kindled. "When we arrived on their frontier world of Ulgethon, the cost of life was severe. Led by a mighty Arbiter, the Sangheili resisted our entreatment with ruthless force, leading to decades of war." After leaving their homeworld Janjur Qom in 2100 BCE, the Reformist San'Shyuum encountered the Sangheili in 938 BCE, who also had experience with Forerunner technology. First contact between the two species occurred in a Sangheili-colonized system on a world that contained Forerunner artifacts. The San'Shyuum believed that incorporating Forerunner technology was allowed by their religion. To the Sangheili, such a thing would have been unthinkable heresy. The San'Shyuum attempted diplomacy with the Sangheili; they sent a delegation to the Sangheili frontier world of Ulgethon to explain that they, too, worshiped the Forerunners. The Sangheili summarily executed the delegation, thus beginning the hostilities. During the combat, the Sangheili had an early advantage, with each warrior comparable in skill to several San'Shyuum in battle. However, the San'Shyuum's technological superiority, and possession of the Forerunner Dreadnought, meant that they had the advantage in space battles, using the Dreadnought to great effect in devastating hit-and-run strikes against the Sangheili war fleets. The San'Shyuum were successful in driving the Sangheili away from their interstellar colonies, while obliterating many Sangheili by appropriating Forerunner relics. The Sangheili were devastated by the lack of honor that the war brought; they were forced to continuously retreat at the San'Shyuum came closer and closer to Sanghelios. Eventually in 876 BCE, in order to ensure the survival of their race, an underground movement of Sangheili scientists covertly began studying their relics and incorporating elements into their warship, weapon and armor designs. Soon, the group of underground scientists emerged and declared their sins, and the Sangheili were forced to amend their position of the treatment of Forerunner technologies to survive. They did not want the San'Shyuum to reach Sanghelios and massacre the planet's populace and defenseless warriors. The scientists were allowed to live and their discoveries were put to use by the creation of new weapons and fleets of ships. The Sangheili began to hold their position and did not give up any territory to the San'Shyuum, though the Dreadnought continued to heavily damage the military. Occasionally, the Sangheili gained ground by employing hit-and-run tactics with slipspace before the Dreadnought could destroy their ships. The San'Shyuum soon began to realize that if there were other species with martial capabilities like the Sangheili, they would be in serious danger. The war eventually led to a skirmish on the Planet of Blue and Red in 860 BCE. The planet's location made it of strategic importance to the Sangheili, however the San'Shyuum desired to take control of the world for the numerous Forerunner artifacts located on and underneath the planet's surface. The San'Shyuum forces were led by Mken 'Scre'ah'ben, High Lord of Sacred Relics, while the Sangheili forces were led by Ussa 'Xellus. Although the San'Shyuum were vastly outnumbered, they used Aggressor Sentinels to weaken Sangheili forces while scientists uncovered and examined the Forerunner structures. Eventually, the San'Shyuum's command stations were breached by Sangheili assassins—forcing all San'Shyuum on the planet to retreat to orbit. High Lord Mken had ordered the Forerunner Dreadnought to fire upon the Sangheili forces, but under Ussa's command, most of them had escaped into a Forerunner structure, which the San'Shyuum were unwilling to damage. The Sangheili on the planet were eventually forced to flee the system. The war was eventually brought to the Sangheili homeworld, Sanghelios. The San'Shyuum and the Sangheili both fought for possession of the numerous Forerunner artifacts on the planet. The state of Vadam was one of the many Sangheili city-states attacked by the Reformists during the battle. However, Vadam keep's well-defended position in Kolaar Mountain prevented the keep from being destroyed. High Charity is constructed following the conclusion of the war and the formation of the Covenant. "So let us cast arms aside, and like discard our wrath. Thou, in faith, will keep us safe, whilst we find the Path." The San'Shyuum-Sangheili War soon led to a stalemate. The San'Shyuum realized that they were unable to be victorious in a war with only one ship. Additionally, the San'Shyuum needed an army since their population was so small. The San'Shyuum turned to the Sangheili and proposed the Writ of Union. In time, the Sangheili learned of the San'Shyuum's belief in the Great Journey, where the Forerunners used the Halo Array to ascend to a god-like state, and wished to repeat this process on themselves. Coupled with this belief and the fact that the cause of war was obsolete, the Sangheili agreed to unite with the San'Shyuum into an alliance to avoid mutual extinction. In 852 BCE, the two species signed a treaty known as the Writ of Union to form the early Covenant, which defined the two races' positions: the San'Shyuum would act as the religious leaders, studying the Forerunners' technology and seeking out the Halos, while the Sangheili would serve as their protectors, using weapons and technology developed by the San'Shyuum. The Dreadnought was decommissioned and made the center point and power source of High Charity, a mobile planetoid which would serve as the capital of the Covenant. Pelahsar the Strident represented the Sangheili when signing, while Breaking Shadow represented the San'Shyuum, both serving as the founders of the Covenant. While most Sangheili willingly—or begrudgingly—joined the new Covenant, there were those who resented what they viewed as submission to the San'Shyuum. The Covenant sought to make an example of these dissenters, silencing those who rejected the new union with overwhelming force. An incarnation of the Swords of Sanghelios formed at this time to bring the holdouts to the Writ of Union to heel. The resistance movement would come to be led by the Sangheili Ussa 'Xellus, a skilled strategist and veteran of the war. 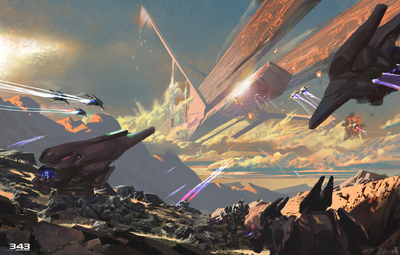 After the Xellus keep was attacked by a Covenant air raid, the civil war expanded across Sanghelios. Because of their inferior numbers 'Xellus and his followers were soon driven into hiding in the desolate region of Nwari. However, 'Xellus would travel across Sangheili colonies, looking for dissidents he could recruit to his cause. After the like-minded elder Sangheili 'Crecka showed him The Refuge, 'Xellus intended to make the Forerunner world his new base of operations and home for his people. Ussa and his followers soon left the Nwari region for the shield world as Covenant assassins closed in on their location. Eventually the Refuge was discovered by the Covenant and a fleet was sent to destroy the insurgents. However, Ussa activated the shield world's Disassembler process, which convinced the Covenant that the rebels had been killed. However, the Sangheili rebels—now known as the Ussans—lived on in the disparate components of the shield world, even after the Covenant's dissolution in 2552. A mural in the elder council chamber in Nuusra.